Danny Rose is ready for a return to the rough and tumble of League Two after stepping up the contact side of training this week following his broken jaw. 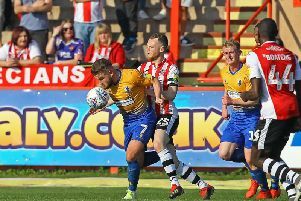 Rose was a surprise inclusion on the bench at Exeter City last weekend where it was decided not to risk him, but the striker has been involved in full training this week and seen his confidence increase. Boss David Flitcroft said: “He is ready now. If I am being honest he probably wasn’t last weekend. It was probably a bit early. “Me and Danny had a chat with 10 minutes to go and luckily the scoreline was in our favour and we looked menacing, so Danny didn’t need to go on. I didn’t want to risk him. “I wanted him to go down with us and be a part of the trip. “But I didn’t really want to put him on. If we’d have just needed something in the last 10 minutes we could have done. The scoreline afforded us the opportunity that we didn’t have to. “Each week he progresses so this week has allowed him a bit more time to heal and get ready. He added: “I am not going to sit here and says to fans he is ready to start as he isn’t. He has missed a lot of football. Flitcroft said a rattling challenge in training by Ryan Sweeney had thankfully probably done more good than harm for Rose. “We did two training sessions last week and you could see Danny getting more confident in and around the players,” he said. “Ryan Sweeney nearly ‘clothes-lined’ him. “I said to the players try to stay away from him but Sweens didn’t, being the competitor he is.